With the weather actually feeling like May for a change I made my way to Edinburgh’s Stand Comedy Club for the monthly all female line-up gig full of expectation for a top quality night of comedy and I wasn’t disappointed. 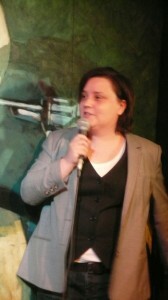 As part of an unusually bijou audience we were welcomed by our MC and compere Susan Calman, who is usually the mainstay of these gigs and as always no matter the size of crowd delivers a masterclass of how to do the role. Susan has a much higher profile these days but doesn’t have any airs and graces, just an honest to goodness class act who is in her natural habitat chatting with the audience, jesting, feeding in some of her material and generally warming up everyone for the acts to follow. She is always different each time and this show was no exception. Ms Calman was on fire and ran with an idea that she was ‘psychic’ a la Derek Acorah to absolutely hilarious effect. She had the entire audience in stitches, nothing new there as this amiable Glaswegian always does, but set the scene for those to follow, the first of whom was Elaine Malcolmson. Elaine seems to have been missing for the scene for a while and I for once have missed seeing her perform. From Northern Ireland originally but now Glasgow based, she has a style all of her own and also is never predictable as to her subject matter. What she is always is a great value act, and manages to draw laughs from unusual ideas and subject. Recent trips to New York, the different meaning of word dependant on where you are from, the NHS and radical solutions to A&E issues and alternatives to medicines TK Max and fridges all were dealt with during her set as only she can. Great to see her back and on top form. Following the first interval and more of Susan’s new found psychic powers filling the short slot was up and coming Natasha Yapp, and in keeping with what is the norm on the night certainly delivered a thoroughly entertaining set. Ms Yapp is of a very complicated heritage and a lot of her material was based on and around this, all of which to me anyway was extremely well written and impeccably delivered. I saw her a few months ago on beginners night Red Raw and since then she has matured as a performer so much. Confident without being cocky she took charge from the off and certainly was well received by all. Definitely look forward to seeing her progress to a longer set. 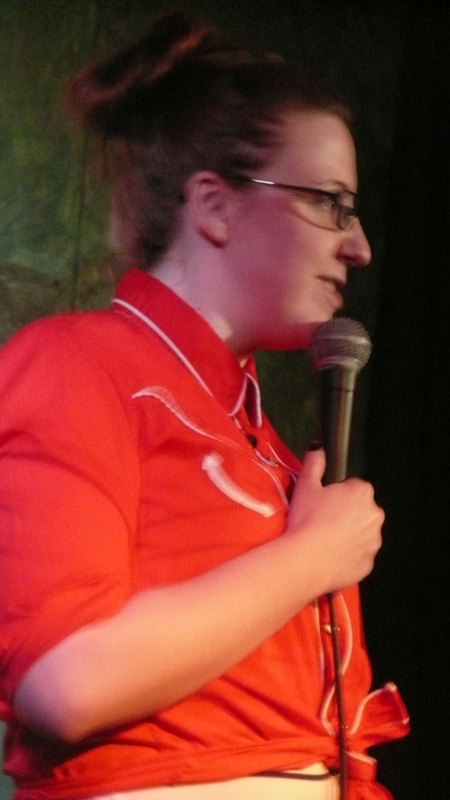 Closing out part two was Lancastrian Katie Mulgrew. This was the first time I had seen this effervescent lady perform and like everyone was impressed with her offering. She seemed to have boundless enthusiasm, some really funny material and bags of personality. 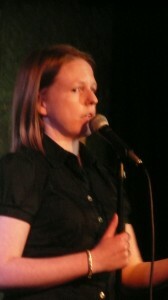 Her range of subject matter was wide, her recent engagement, McDonalds, a friends new child, previous Edinburgh trips and ex boyfriends amongst other subjects were intermingled with audience riffing all to great effect. I would like to see her with a larger crowd to play off as I feel she feeds off audience reaction a lot and the more they give the more she does too, so hopefully next time I’ll see if I’m right. 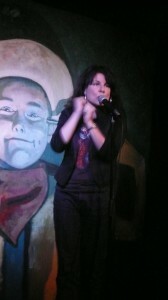 Headline act of the night was the gorgeous Tara Flynn. This multi talented comedian / singer/ actress/voiceover artist has been a favourite of mine for years and if anything looks younger today than she did the first time I saw her. 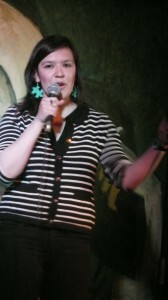 Tara has total control from the start, captivating the punters with her mix of comedy and music. Starting off with some really funny stuff on her native Ireland, tourism, Ryan Air ‘The Gathering’ and the boom years there moving through to her recent marriage and her moving into her middle youth , Ms Flynn royally entertained. And as a bonus she completed her set with three of her songs to demonstrate not only her vocal abilities and styles and also song writing abilities, a really enjoyable ending to a fine set. And for another month that was that. Ms Calman closed it out and we all had to leave. Still next month it’ll be back okay a new line-up but without doubt the same high standard. For details of this and all other shows at The Stand in Edinburgh, Glasgow or Newcastle check out the website www.thestand.co.uk ad you can book tickets for their Edinburgh Fringe line-up too.